I normally avoid jersey cards like the plague, but when I find one of the right player–and for the right price–I usually get a weak in the knees, re-think my dislike of such cards and then end up buying it. 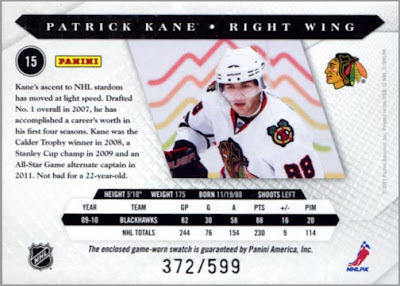 This was the case recently, when I found a 2010-11 Luxury Suite card of Patrick Kane at my local card shop. It features a red jersey swatch. 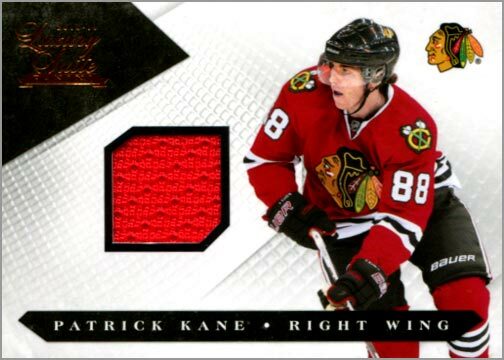 Not only is that better than the ubiquitous white jersey swatch, but Kane is wearing a red jersey on the card front. 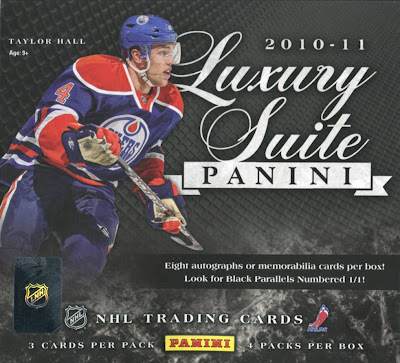 The back of the card uses a different photo than the front–perhaps because Luxury Suite is a high-end set. I am glad that they didn’t use this particular photograph on the card’s front, as Kane is wearing the white road uniform here. Jersey cards look 10 times better when the swatch is the same color as the jersey worn in the photo. Maybe because, at a subconscious level, you think that the piece of jersey is from the jersey the player is wearing. 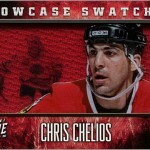 If the swatch does not match the photo (even if it is the “right” team), I am way less likely to buy it. 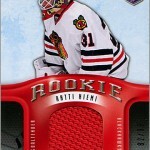 Question: Are you more likely to buy a jersey card if the swatch matches the photo (white/white or color/color)? Anything other than white is a definite plus. My biggest pet peeve is when the jersey is obviously from another team altogether. Love the Patrick Kane. I think of him as cocky but he was very self deprecating when questioned the other day about his All-Star Game selection. He said something to the effect of wanting to play better in the second half of the season and be deserving of the honor. Maybe Captain Serious is rubbing off on him a little. Yeah, we all hate the "FrankenCards" that use an entirely wrong swatch. I got one of Ray Bourque that shows him with the Bruins, but the blue swatch is clearly from an Avalanche jersey. Kane and Toews make for an interesting pair–two extreme opposites that play very well together. I have a great Bill Guerin Ultra Uniformity GU card where it shows a picture of him in a San Jose Sharks jersey, it has a two color swatch that is clearly his green and white Dallas Stars jersey, and the team name on the card is New York Islanders. If that isn't a tri-fecta of stupidity, I don't know what is. But yet, I like it all the same. Can't say that I've never paid much attention to having the jersey swatch correspond to the colour of jersey the player is pictured in. If it's of one of the guys I collect, I need it, and I can get it at a decent price then I buy it. Like Justin G. though, overall I pay more attention to the overall look of the card. I try to collect non-white swatches, and if the color matches the photo it's just a bonus. If it's a white swatch and white jersey photo I'll still try and get a colored swatch. I agree with DFG, there are some stupid jersey cards out there that have a three different teams on one card. These cards get put in the "Send to DFG" pile for our next trade. The only time I've been pleased to get a jersey card with the player's previous team from the one pictured on the card was a Brian Leech. It was toward the end of his carrier and he's pictured in a Bruins uniform, but the patch was blue from a Rangers jersey, the team he's best know for and his best years. Otherwise I mostly like getting a multicolored swatch especially if you can tell exactly where on the uniform it came from.